How to Mindfully Use Technology? - Something New Everyday! Home technology How to Mindfully Use Technology? How to Mindfully Use Technology? Technology addiction is seemingly widespread these days. You may even find yourself wondering if you are addicted. In our modern interconnected world, it can appear impossible to escape the Internet. Social media is no doubt a valuable tool that can help us achieve this connectedness with others. But its widespread availability to us anytime, anywhere can also lead to overuse as we find ourselves constantly chasing this feeling. Fear of missing out is now such a common experience that its popular online abbreviation (“FOMO”) was added to the Merriam-Webster Dictionary earlier this year. Have you ever felt you needed to cut down on your technology usage? Have people annoyed you by criticizing your technology usage? Have you ever felt guilty about your technology usage? Even if you don’t think that you’re addicted to technology, answering yes to any of the questions above is an indicator that now might be a good time to rethink your relationship with technology. Modern technology is, of course, a good thing. But it should not control your life. Being able to mindfully use technology and finding the right balance is important. 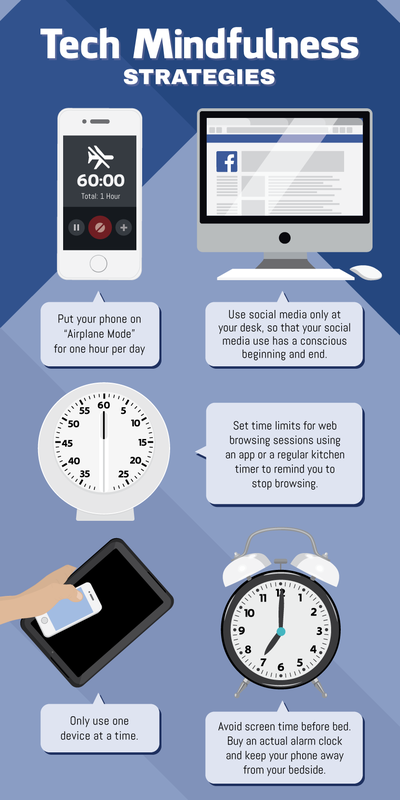 Buddhist author, teacher, and avid social media user Ethan Nichtern suggests putting your smartphone in “airplane mode” for one hour per day to allow yourself to focus on other things.8 Nichtern also suggests only accessing social media sites from a desk and following predetermined time limits for web browsing sessions.9 These ideas may sound difficult – even radical. If so, this may be an indicator of just how much your devices control you. It’s also a good idea to try to avoid multitasking with technology, as doing so increases stress. Try to limit the number of tabs you have open in your web browser at one time. Resist the temptation to use multiple devices at one time (computer, phone, TV, etc.). If you find it hard to set limits for yourself, there are numerous apps (Freedom10 is one example) that you can download to limit your web browsing time. Of course, you can always just use a good old-fashioned kitchen timer. It is also important to limit your screen time before bed. Technology use has been proven time and time again to have a negative impact on our sleep. We need time to clear our heads before sleeping. The Internet keeps us overstimulated and doesn’t allow us to decompress. The blue light of digital screens has also been shown to disrupt our natural sleep rhythms. Try reading a book, taking a bath, journaling, or any other relaxing, nondigital activity in the hour before sleep. Here’s something that’s important to remember amid all this talk of technology addiction: iPhones, social networking sites, cameras, Adele concerts, and Pokemon are all good things. Mindfulness is the key here. Maybe just take a couple of snapshots at your next concert. Maybe you only need to check Twitter twice per day instead of every fifteen minutes. Maybe you don’t really need to catch Pokemon at your next State Department briefing or when crossing a busy city street. After all, it’s not whether you use these technologies, but how you use them. Rethinking your technology use can make you happier, better rested, and more productive. And you wouldn’t want to miss out on that! With files from Jesse Markway. Jesse is a St. Louis-based freelance writer and musician, writing songs about everything from baseball to dogs.